Added detection for DIMM configuration. 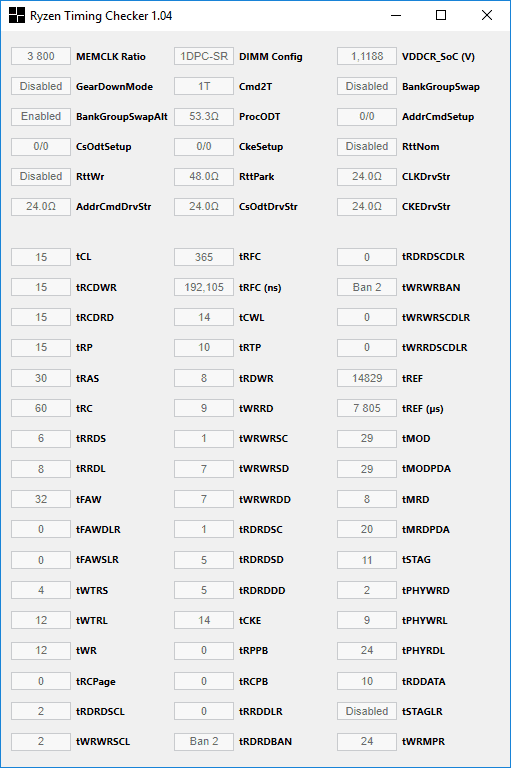 Added VDDCR_SoC voltage readout (single measurement) for AM4 platform (not available SP3r2 / "TR4"). 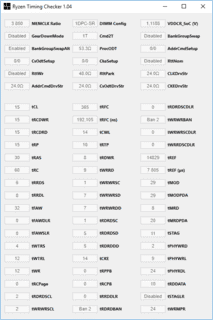 Added support for reading Threadripper CAD & Data bus settings with AGESA fTPM enabled. Improved CAD & Data bus parameter reading. Fixed an issue which prevented the application from terminating correctly. Added CAD & Data bus parameter reading for Zeppelin based Ryzen parts (Summit Ridge, Pinnacle Ridge, Threadripper). Summit Ridge requires 25.83.0 SMU firmware version (PinnaclePI 1.0.0.0a based bios) or newer for the new parameters to be supported. The program was migrated to C# (from AutoIT). Fixed timing detection in single-channel mode, when A1 or B1 slot is populated.